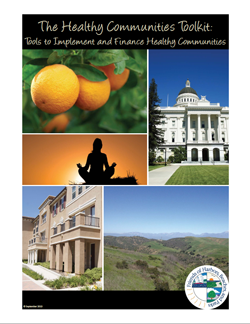 “The Healthy Communities Toolkit: Tools to Implement and Finance Healthy Communities” was released in December 2013. This Toolkit describes the policies and best practices being pursued by communities in California and elsewhere to build healthier communities by directing growth into walkable neighborhoods in existing communities and conserving important local and regional agricultural and natural lands. It is unique in providing case histories that illustrate how regions and communities are collaborating to achieve a unified vision of sustainable communities by relying on a cohesive constellation of policies and best practices. This publication is copyrighted by FHBP, 2013. Reproduction can occur only with the express written permission of FHBP and credit must be given to FHBP.